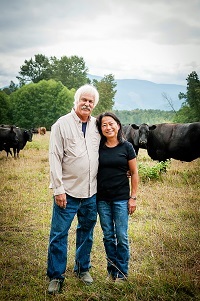 We raise about 300 certified organic, 100% grass-fed Angus (100) and Wagyu (200) beef each year for sale. 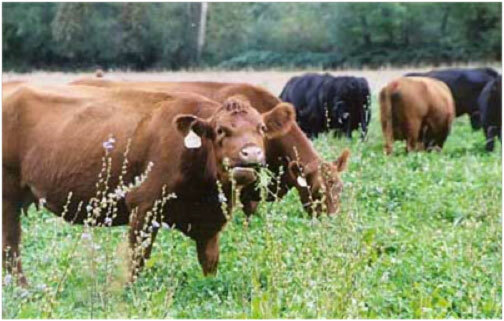 They spend their entire lives on organic pastures, benefiting from rotational grazing on the freshest, most nutritious grasses and herbs. They receive a special mineral mix with sea salt and kelp - custom formulated for our local soils and climate - which helps keep their immune systems strong. The fat has a naturally creamy yellow color due to the high vitamin A & E content, and is rich in Omega 3 fatty acids and Conjugated Linoleic Acid (CLA) – known anti-oxidants with cancer-fighting properties. A USDA certified mobile processing unit harvests our animals on our farm rather than on a feedlot. This is the most humane method available. This unit was the first one built in the nation operated by farmers, and is the most successful operation to this day. We then hang our beef for a minimum of two weeks. The meat is cut, vacuum sealed, quick frozen and kept in commercial cold storage to hold in the freshness.